Elton John: Jesus was Gay! Elton John has upset religious fundamentalists by inferring that Jesus Christ was a gay man. In a new interview the 63 year old pop star said: “I think Jesus was a compassionate, super-intelligent gay man who understood human problems. His comments have sparked a row with high profile evangelical minister Ian Watson, who recently led a campaign against gay clergy men in Scotland. Watson told The Daily Record: “There is absolutely no truth whatsoever in what Elton John has said about Jesus being gay. In the interview with Parade the Rocket Man singer talks candidly about his previous addiction to drugs and how he “lost the plot” during the period he was addicted to Cocaine. “For some people a gram of cocaine can last a month. Not me. I have to do the lot, and then I want more. At the end of the day, all it led to was heartache. “Just about every relationship I ever had was involved with drugs. It never works. But I always had to be with someone, good or bad, otherwise I didn’t feel fulfilled. John who has been clean for many years goes on to say how he’s grown tired of being a celebrity. 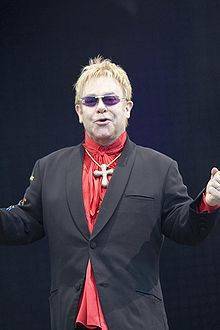 In support of his religious ‘gaff’ the chaplain for Church of Scotland group Affirmation Scotland, the Rev Lindsay Biddle, said: “I think it’s wonderful for anybody, including Elton John, to imagine Jesus as being like them. Ten years ago the world was quite a different place when it came to discrimination – particularly in regards to bigotry aimed at sexual preferences. As a music genre Rap is littered with what many would term misogynist and homophobic lyrical content. As the world changes such blatant discrimination is no longer being tolerated – at least by the gay brigade. Although not retracting the anti-gay content in his lyrics, rap star Eminem has bowed to pressure from gay rights activists and will be omitting offensive anti-gay references during his forthcoming UK appearance. The face off between the star, real name Marshall Bruce Mathers III, and gay rights group OutRage! came soon after Mathers expressed interest in the offer to appear at Wireless Festival. The music event, owned and managed by Live Nation, is held yearly in London’s Hyde Park and attracts tens of thousands of fans over several days. Organisers feared picketing by OutRage! 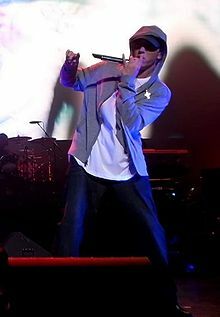 could spell disaster for both the event and Eminem’s performance and have since received assurance from Mathers that anti-gay lyrics will not be used during his show. It’s not the first time the two have met. In 2001 OutRage! demonstrated outside venues throughout Mathers UK tour. Eminem has not performed in the UK since, apart from a secret show in Islington in 2004. “He is free to express his views on gay people, as long as he stays off the violence and hatred. He has got plenty of other lyrics to choose from. OutRage! Have also collared dancehall stars such as Buju Banton and Sizzla for what they allege to be homophobic lyrics that incite hatred and violence against gays. Both artists have in response cancelled shows in the U.K.
X-Factor Joe: I’m not Gay! Well you could knock us down with a pink boa. X-Factor winner Joe McElderry has quashed the ‘is he or isn’t he?’ rumours by confirming he’s…straight (?!). Despite mincing his way through 25 X-factor episodes the 18 year old Geordie star says he fancies ‘Kylie’ (ahem) but doesn’t have time for girls at the moment (double ahem). Who cares? We love him anyway and our arms are open should he suddenly bust out of a closet. In fact we could do a lot worse than having a squeaky clean gay role model for a change – that duet with Georgina Michael was a tad cringifying it must be said! According to The Mirror the X-Factor star has suffered homophobic bullying since an early age (and there’s one thing for sure: kids just always know – ok ok we’ll let up! Call it wishful thinking!). Former girl friend Carly Dilbert, now a bar maid in McElderry’s home town of South Shields, said “Joe was brought up by his mum, his nan and his auntie and all his friends were girls. I suppose it made him a bit more effeminate and sensitive than most guys. People thought he was gay, but we knew the truth. Currently battling it out with Rage Against The Machine for the Xmas No.1 McElderry brushed off the gossip with a smile “I’m straight. I’ve had girlfriends, but I don’t have one right now. I haven’t slept with anyone, but I’m a young lad and I’m concentrating on my music. Australian pop princess is wowing a legion of gay fans on her first ever tour of North America. Pink feathers, sparkling leotards, sci-fi glam-tastic costumes and muscle boys aplenty – topped off with a large dollop of Aussie charm – it could only be Kylie Minogue. The 41 year old singer who has achieved pop superstar status practically everywhere except America arrived in the U.S. this week for a nine date tour. Hitching a ride atop a giant silver skull that descended slowly to the stage Minogue opened the first night of her U.S. extravaganza with “Light Years” and proceeded to wow the audience with a two hour dance-pop repertoire that could only be matched by Madonna. “You’re everything I’ve dreamt of for 20 years” she told the screaming crowd made up of pre-teens, women and, of course, gay men. The star’s gay appeal extends around the globe where she has consistently topped gay pop diva polls for the last two decades. Despite topping the charts several times in Britain, Europe and Australasia she has only ever scored two sizeable hits in the U.S. with “Locomotion” and “Can’t Get You Out Of My Head”. It’s been quite a journey for Minogue who first came to prominence in the Australian soap opera “Neighbours” in the mid 80’s. Her first single release, a cover of 60’s hit “Locomotion”, made number one on the Australian charts and lead to an association with pop hit producers Stock, Aiken & Waterman who penned many of her early hits. A breast cancer diagnosis in 2005 halted Minogue’s career for a period, but she bounced back in 2008 releasing her 10th album ‘X’ and a world tour that saw her perform in more than 21 countries.